RNAO's Award of Merit goes to an RN or NP who has made outstanding contributions to RNAO and the nursing profession in Ontario. This resourceful individual is a change-maker, advocating for, promoting, and initiating changes to improve healthy public policy through RNAO initiatives. This person serves as a resource and mentor, contributing to and enhancing the role of the RN/NP in Ontario. Paula Manuel has been a member of RNAO for more than 25 years. She is no stranger to the association's chapters, regions and interest groups. She has held multiple executive positions on the Staff Nurse Interest Group (SNIG) and is currently its treasurer and chief scribe (blog and social media editor). 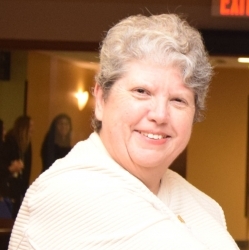 She has also been on RNAO's board of directors for three terms as the Region 6 representative, and was a panel member for the Developing and Sustaining Nursing Leadership (First Edition) BPG. "I feel like I've grown up with RNAO," says Paula, who often takes part in events such as Queen's Park Day and Queen's Park on the Road. Since joining the association, Paula has found a passion for mentoring nursing students and nurses, as well as giving presentations about important topics such as shift work, self-care and leadership. "It is an awesome responsibility to teach others about what this grand profession is about," says Paula, adding that her second career choice would have been a teacher. Now, as a seasoned RNAO member and a clinical services manager at William Osler Health System's Etobicoke campus, Paula only sees herself continuing to grow and evolve, maybe running for RNAO president some day, she muses.